Patient engagement should be envisaged as a key priority today to innovate healthcare services delivery and to make it more effective and sustainable. The experience of engagement is a key qualifier of the exchange between the demand (i.e. citizens/patients) and the supply process of healthcare services. To understand and detect the strategic levers that sustain a good quality of patients’ engagement may thus allow not only to improve clinical outcomes, but also to increase patients’ satisfaction and to reduce the organizational costs of the delivery of services. 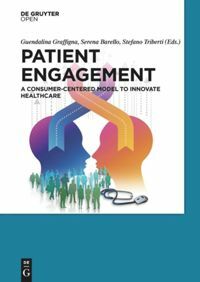 By assuming a relational marketing perspective, the book offers practical insights about the developmental process of patients’ engagement, by suggesting concrete tools for assessing the levels of patients’ engagement and strategies to sustain it. Crucial resources to implement these strategies are also the new technologies that should be (1) implemented according to precise guidelines and (2) designed according to a user-centered design process. Furthermore, the book describes possible fields of patients’ engagement application by describing the best practices and experiences matured in different fields. Why a new book on patient engagement? Policy makers, health professionals and scholars across the world agree about the urgency of better engage patients in their process of care, but concrete guidelines for practices do not yet exist. To date the issue of patient engagement has been addressed in only sporadic peer reviewed articles and managerial position papers. Sound guidance including a more comprehensive and applicative vision on this complex phenomenon are thus urgently needed. By assuming a Consumer Psychology perspective, this book offers a comprehensive theoretical vision on patient engagement by suggesting concrete tools and insight and adoption. Following introduction of the Patient Health Engagement Model (PHE model), and its value to orient healthcare practices, this book discusses how new technologies are crucial resources to enable innovative interventions aimed at promoting patient engagement. The book concludes by suggesting possible fields of patient engagement interventions application in different healthcare settings and situations. Chapter 1 (Guendalina Graffigna, Serena Barello) introduces the value of opting for patient engagement as a key to truly innovate healthcare and to guarantee a renovative partnership with its different stakeholders. Chapter 2 (Guendalina Graffigna, Serena Barello, Stefano Triberti) is conceived as a “glossary” aimed at defining the main concepts that today are used to qualify the active role of patients in their care course. Chapter 3 (Guendalina Graffigna, Serena Barello) introduces a healthcare consumer psychology perspective, and the Patient Health Engagement Model (PHE model) with its four experiential phases (i.e. blackout, arousal, adhesion, eudaimonic project). Chapter 4 (Stefano Triberti, Giuseppe Riva) illustrates how patient engagement can be achieved thanks to the smart use of technological tools designed to improve wellness and health through the scientific paradigm of Positive Technologies. Chapter 5 (Stefano Triberti, Giuseppe Riva) presents general insights along with an operational model in order to explain how positive technologies for health engagement have to be designed, including User-Centered Design (UCD) and a new model, the Perfect Interaction Model (PIM). Chapter 6 (Stefano Triberti, Serena Barello, Guendalina Graffigna, Giuseppe Riva, Antonio Candelieri, Francesco Archetti) presents an example of a technology-based intervention, which will be evaluated from the joint viewpoints of User Experience and Patient Engagement. Chapter 7 (Stefano Triberti, Serena Barello, Guendalina Graffigna, Giuseppe Riva, Antonio Candelieri, Francesco Archetti)authors discuss potential solutions for delivering consumer-oriented decision making: particularly, concrete tips for talking with patients by taking into account their level of health engagement and attitudes toward their involvement in care decisions. Chapters 8 (Serena Barello, Guendalina Graffigna) and Chapter 9(Livio Provenzi, Serena Barello, Guendalina Graffigna) discuss the value and the challenges of engaging family caregivers in the patients’ care. Chapter 10 (Serena Barello, Mariarosaria Savarese, Guendalina Graffigna) offers an insightful picture about how hospitals should respond to the call of patient engagement by enabling a number of participative initiatives to innovate present care delivering models.